If you think tornadoes on Earth are scary, newly found “space tornadoes” sound downright horrifying. But they are likely the power source behind the beautiful Northern and Southern Lights. A new finding by a cluster of five space probes – the THEMIS, or Time History of Events and Macroscale Interactions during Substorms show that electrical funnels which span a volume as large as Earth produce electrical currents exceeding 100,000 amperes. THEMIS recorded the extent and power of these electrical funnels as the probes passed through them during their orbit of Earth. Ground measurements showed that the space tornadoes channel the electrical current into the ionosphere to spark bright and colorful auroras on Earth. The findings were presented today at the general assembly of the European Geosciences Union (EGU) in Vienna, Austria. THEMIS is detailing Birkeland currents from the Sun to the Earth. Plasma Cosmology has been speaking about giant electrical tornados in space for along while now. I welcome your comment because it illustrates the three step paradigm shift. First, the status quo ridcules and mocks or ignores entirely. Second, they fight tooth and nail and present detailed arguments against the new idea. Third, they claim there were never any doubts at all that the new paradigm was accepted by the status quo. Tell that to your friends that have been arguing tooth and nail against electromagnetism every step of the way. But to extend an ollive branch of cooperation and conciliation: The constructive path is to determine the respective roles of electromagnetism and gravity in the structure of the Universe. Yes, gravity has a role, what that role is exactly, is yet to be determined. Yes, electromagnetism has a role, what that role is exactly, is yet to be determined. Everybody needs an open-mind — not just lip service — and all the available evidence must be considered, analyzed & interpreted with all possible energy dynamics in mind. Please. Your revisionism is most obvious for any consistent reader of these comments. The riducule and mockery of Electromagnetism was here for all to see. And that was well after plenty of hard scientific evidence was available. In fact, a substantial body of scientific work was vailable and presented, here, by myself and others. I have no problem with resonable scepticism, that’s all part of the scientific method. But the discussion, here, was strongly tilted snide comments and sneering acknowledgement when ironclad evidence was presented. Oh yeah. How about “dark” matter, “dark” energy, “neutron” stars, and “black holes”? There are so many holes in “modern” astronomy’s take on the observational evidence, it’s a joke. You’re not being honest with yourself. Here I specifically offered “an olive branch”, but how do you repond. A long winded justification and all out revisionism. Astrofiend, it’s hard to take you seriously when I recall the tenor and tone of your comments. Sneering, exhibition of denial don’t suggest to me you are a serious scientist at all. But, now, maybe, you’ll show your better half. Call it whatever you want, no fancy name can change the fact of what it is. Actually, there are some ideas, Nikola Tesla expermimented with ways to tap into the electric potential between the ionosphere and the surface. The Wardenclyffe Tower was partially an attempt to tap into this electrical energy and Tesla conducted experiments at Colorado Springs that suggested he had been at least partially successful. I did answer your responses, you just didn’t like the answers. Maybe, it’s time you did independent research on the question of electromagnetism in space — with an open-mind. I notice you didn’t respond to the link provided that discussed predictions made by Wallace Thornhill. Also, I note no response to the “dark” matter, “dark” energy, ect. ect. assertion for why Plasma Cosmology does provide a better explanation than “modern” astronomy. Plasma Cosmology doesn’t need any of those fudge factors. So-called “dark’ matter: Pixie dust for “modern” astronomers stuck in Never, Never Land. @cipater: You raise an interesting point there. It is exactly the same question I asked my lecturer when I was studying solar wind interactions in the upper polar atmosphere for my masters. Although the current feeding into the poles may sound huge, the 100,000A current is spread over a volume the size of our planet; local current density is actually very low – there’s no way we could harness this as a source of energy (unless we had some kind of sci-fi, Earth-wide collector that is). Having said that, during auroral substorms in the ionosphere, auroral electrojets may be generated. These electrojets are long snaking regions of current, redirected from the magnetotail after reconnection, which generate their own magnetic field. If an electrojet passes over a national power grid for instance, the field can induce a boost in current in the grid, overloading it (this happened during the Quebec power grid outage in 1989). 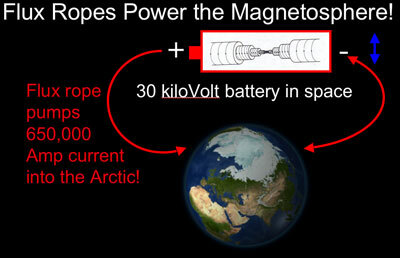 And here I thought the “magnetic flux ropes” delivered upward of 650,000 Amps of electric current! Heh. And the Io-Jupiter flux tube carried a million Amp current? Jupiter’s auroras themselves carry like 10 million Amps. Boy, the solar system is just kind of humming with electric currents, eh? Is there any theorized, practical way to capture all that energy? It’s right on our doorstep! There never was any doubts that electromagnetic forces play a role in the Universe. Where EU disassociates itself with reality is that they insist EM is the *only* dominating force. Anyways, good article. I love Aurora! HOLY SH!T! An electromagnetic phenomenon has been observed in space. It must be time to change to a new cosmological paradigm and stuff! Come to think of it – it’s amazing they sent these craft up at all, let alone released the results freely to the public considering the overarching conspiracy in science to suppress PC/EU ideas… Silly silly conspiratorial scientists! Oh God Anaconda! Stop playing the victim all the time! Clearly – there are a million poorly developed ideas of how the world should work. Once your idea gets some rigor behind it and a few verified predictions under it’s belt, then it will begin to be taken seriously. An idea must prove its worth before it is seriously considered for any length of time. If a result like this one is predicted by your theory with cogent arguments, and is cannot be arrived at using traditional plasma physics, then chalk one up for your particular brand of plasma physics! Imagine trying to disprove or falsify an idea! The very hide of those scientists! Anyone would think we were trying to get to the bottom of things and discover what makes this universe tick… Yep – that’s what scientists do – they try to disprove things. They argue against concepts that are new and unproven. If your ideas are verified and prove to be robust, then they will be adopted, regardless of your belief in an overarching conspiracy against you. That is just how science works mate. You’ve invented some idea that we fight against electromagnetism. I do not. I have studied many related subjects at uni including Plasma Astrophysics and Electromagnetism. I have never argued against its existence or the experimentally and observationally verified fact that such processes do play a large part in the goings on of the universe. I argue against claims that electromagnetic effects due to plasma play a dominant role in the large-scale evolution of the universe, mainly because the observational evidence at this stage seems to be largely explicable without invoking plasma cosmology. If you (or somebody) can rigorously show that the mechanisms proposed by your plasma cosmology either better explain the data or can patch up the holes in current theories – go for it! I will be literally the first to congratulate you and admit I was wrong. I have no problem with being wrong or with any particular theory per se, I argue against what I perceive to be weak and underdeveloped theories. In science, that’s what happens. So stop whinging and playing the eternal victim (boo-hoo – the scientists are mean and they don’t adopt my theory even though I think about it really really hard all the time) – grow a pair and show me what your theory can do! Couldn’t agree more – let’s sort this issue out. How’s that done in science? By arguing the point and making the other party back their horse and defend their ideas. Please Dave, with all due respect, show me ONE place in the published EU literature where this is stated. NOT some ‘supporter’ who has things ballsed up, but within the published works of the EU crowd. Just ONE is all I ask. The problem here is, that EU is grossly MISrepresented by many, both supporters and opponents thereof. Magnetic fields may be accepted in astronomy, but electric currents,rarely. As far as I know, the Electric Universe has never denied gravity, only that electricity plays a more important role than generally accepted. At 10^5 amps would require a hell of a lot of volt-seconds to give energy comparable to what gravity predicts. I figured the PU nuts would grab onto this one. This physics is in line with the VanAllen research on diffuse plasmas around the Earth. It is interesting in its own right, but it says nothing about gravity. @Eric: Actually, electric currents are widely accepted in astronomy, astrophysics and cosmology. But after decades of rigorous astrophysical study, it has become a well-known fact that magnetic fields are a dominating factor. For some reason, some of these comments scoff at mainstream physics and how solar-terrestrial physicists somehow ignore field-aligned currents. Hmmm. Odd. I remember several lecture courses in my mainstream physics higher education focused on electric currents in space plasmas. So many times I see hopelessly misinterpreted physics theory being used as “proof” that there is some kind of mystical all-powerful electric current that floods the Universe (explaining everything from craters on the Moon to the highly bizarre ‘Electric Sun’ theory). Unfortunately many of these ideas are so cringe-worthy, it is an affront to plasma physics. But then I remind myself, all of these theories have been invented by non-specialists in the field of space science. There’s a good reason why EU was removed from Wikipedia, and why, even after years of noise-making, that only a very small number of people give it the time of day. Didn’t feel the need to respond to my post so you thought you’d dismiss it as revisionism? That’d be unlike you Anaconda! And ‘a long winded justification’ is otherwise known as an explanation of my position. Sorry if it was a bit wordy. >I’ll make sure that I take a good, hard look at myself. Sometime. The thing is, I find it hard to take YOU seriously, when most of your comments are simply of the form “this (insert mainstream scientific theory here) doesn’t exist, but this (insert Anaconda’s pet idea here) does and is correct.” This to me demonstrates a flagrant disregard for any sort of scientific objectiveism or requisite doubt. Hence, it is only to easy to respond in precisely the same way. And that pisses you off?! You pretend to be moderate in your views (and certainly you seem to be in comparison to the likes of Oils), but every so often you let one slip that gives the game away, and it’s there for all to see. Maybe that is out of frustration – it doesn’t bother me either way. I don’t take too much seriously – I’m quite immature, really. >Hmm – better 1/16th more like it. Anaconda – I have nothing against you – I attack your ideas and I can be a smart arse about it . Feel free to dish it back to me – I can take it because I’m a big boy. Agreed – my s__t talking has gone on for too long! In answer to your question, I cannot envisage any practical way of harvesting this power. But then again, how do we define practical? @Ian T.: Actually, there’s been several comments pointing out electric currents are being ignored (that’s why I responded). That is the mainstay of EU theory: not enough attention is being paid to… erm… the ‘electric universe’. I’m not sure what your point is, but if there was anything ‘standard’ about EU theory, it would have some merit. And I beg to differ about these mystical currents. If the ‘Electric Sun’ hypothesis is anything to go by, there’s one hell of a lot of mysticism riding on those currents. Cipater – you wouldn’t happen to be an Autechre fan would you? You’re making the claim that plasma cosmology provides a better explanation than the currently accepted ideas – the burden of proof is on you my friend. All of the mainstream stuff is continually published in journals, so you can look it up any time there. Your theories are not so easy to find, and seeing as you are promoting it as an alternative to the published materials, I would think that you would be more than happy to reference the finest , most cogent and the most rigorous refutations of mainstream theory and defenses of your own. For one – HOLY SH_T! The theory is that electical arcs created Valles Marineris? That cannot be a serious consideration, surely! Two – the prediction is that ‘a great deal of Sulfur MAY have been made’. Wow – concrete – don’t put yourself out on a limb or anything Thornhill. And I agree – ‘dark matter’ and particularly ‘dark energy’ are such loosely defined concepts that it is little more than a fudge factor. In fact, they are basically names for discrepancies. Whether these discrepancies can be explained by the proposed solutions is something else altogther. Maybe they can, maybe they cannot and we’ll come up with something else. The point is, I’m not denying that astronomy has huge gaps of understanding, or promoting the idea that we understand everything and that all is well. I simply happen to believe that we are on the right path, which you claim we are not. Fair enough, but when we strip away all the BS, I’ve seen no convincing arguments from plasma cosmology, and even less rigour. I look at websites that claim to expound these theories, and all they contain is verbal diarrhea and hand-waving vagueness. Prove me wrong though. If plasma cosmology is a true description of nature, then it will literally explain everything we can observe or see. So get to it and show the scientists a thing or two if you’re able. That was a good one – you worked on that one for a while, didn’t you? Dave Smith: “Please Dave, with all due respect, show me ONE place in the published EU literature where this is stated. NOT some ’supporter’ who has things ballsed up, but within the published works of the EU crowd. Just ONE is all I ask. Pretty much all of them. Believe me, I’ve read many. My favorite is the one that claimed that electric arcs created the craters on the moon. You probably know which one I am talking about. As soon as I saw the title of this post, I figured that the EU/PC nuts would be wetting their knickers in delight. They remind me of those punters, that you often see at the race track, who scream, shout, rant and rave when their 11/10 fav. (BIG DEAL!) horse romps home, but they completely ignore the fact that favourites have an average strike rate of ~30% and at such a lousy return price that the poor punter makes a net loss in the long term — bookies love people like that! Exactly! I have asked this question before of the EU/PC proponents, to which I did not get a plausible answer, so I will ask of them again: What is the source of that “mystical all-powerful electric current that floods the Universe” and allegedly powers the “Electric Sun”? @ Ian O’Neil, I most heartily must agree with your comments above to Eric concerning EU/PC proponents. You state “There’s a good reason why EU was removed from Wikipedia, and why, even after years of noise-making, that only a very small number of people give it the time of day.” Back at the discussion of “Do we need a new theory of gravity” on this site:http://www.universetoday.com/2009/04/21/do-we-need-a-new-theory-of-gravitation/ MOND theory was brought up. MOND challenges some of our most basic assumptions in physics and is certainly a challenge to the standard model. Most EU/PC proponents will say that 1) there is some conspiracy by mainstream science to deny and suppress information about EU/PC or 2) there is peer-review bias in professional journals. IF either one of these statements are true, why is it that I can find hundreds of peer-reviewed published papers on MOND (which has been around since 1981, remember), but only a handful of EU/PC papers in a field that supposedly goes back to 1907. Why is it I can find so many published papers on MOND if statements 1 and/or 2 are correct. Or is the argument now that the standard model AND MOND get a pass but EU/PC are still subject to 1 and/or 2? I think MOND deserved some scrutiny from the astrophysics community because of certain testable predictions were being made and a sizeable body of literature began to accumulate. Even though MOND theory may be showing signs of age, it obviously stimulated the astrophysics community to confirm or refute its’ predictions. But just the existence of the MOND literature (or one or two EU papers) negates both statements 1 and 2. Unfortunately some of the commenters totally fail to see the irony in this matter, or just choose to ignore it completely. This is the point where I could never follow the EU ideas – it comes across to me as a chicken and egg scenario: In my World, the current has to be there in order to create the plasma. Seen through my eyes, this notion amounts to a perpetual motion machine of the “first type”. Space tornadoes – OK; Is it possible that atmospheric tornadoes are formed or influenced to some extent by charged particles, electric and magnetic fields? A few of us worked on a paper and got it published in the Journal of Electrostatics. I don’t really understand the basis of all the ridicule, noise, and emotion – these are just theores that need to be proved or disproved. The gaps in scientific knowledge are becoming clearer – what is the physics of a tornado? How high do the highest microbes get? Did life originate on Earth or was it depositied here by a version of transpermia? Is there life on Mars? Very interesting questions that need answers. Wowowow, no where is there any reference to EU! Standard model did already know that solar wind gets guided to the poles where because of Earths magnetic fields where they cause aurora’s, what is new that these magnetic fields tend to behave like tornado’s. Also these magnetic fields are powerd by an outside source than plasma itself. Rember! EU does not allow gravity and EU does not allow nuclear fusion, and also no magnetic reconnection. Remember! EU clames that plasma tests in laboratory proves EU, but when I pull out the plug from my plasma ball, all plasma revert to it’s normal state. There is absolutely NO relationship between EU and this, except that they both happen to have the same name like plasma, electrical current and magnetic field, but there it stops. I am sorry, you cannot clame to believe in EU and say in the same sentence “but I also believe in gravity”. If you believe in gravity then you you cannot say that you are promoting EU anymore since you deny the very core that EU is! That gravity is caused by the flatning of the subtronic orbits of the strucutures inside the electron which has not been proven so far! Claming that you believe that EU is the only truth out there but gravity does exist, is like saying that you do believe in God but Jezus is fictional. EU clames only to have the electromagnetic and the rest is the result of this electromagnetic which is clearly disproven by many large collider experiments. Yes one unified force could explain electro-magnetiscm but electromagnetism DOES NOT explain the unifying force!!!! BIG difference!!! It is only 25% of the 4 fources! EU the Scientology of Cosmology. Please Dave, with all due respect, show me ONE place in the published EU literature where this is stated. NOT some ’supporter’ who has things ballsed up, but within the published works of the EU crowd. Just ONE is all I ask. This response doesn’t answer the question, nor even touch on it! Please tell me, where in the published EU literature, it is stated that “EM is the *only* dominating force.” Craters on the moon have little if anything to do with your initial statement. Olaf let fly with a typically strawman MISrepresentation of EU, making claims which are quite wrong about the theory, and then ridiculing his own claims. I rest my case. … astrophysical plasmas are the standard/default state of matter, and are already at sufficient energy levels that they do not require “maintaining”. You mean like the ‘resting’ parrot nailed to its perch? Astrofiend: Yep! I’m a rabid Autechre fan. Cipater is one of my favorites by them. @ Dave Smith, above you have stated “… show me ONE place in the published EU literature where this is stated. NOT some ’supporter’ who has things ballsed up, but within the published works of the EU crowd. Just ONE is all I ask. The problem here is, that EU is grossly MISrepresented by many, both supporters and opponents thereof.” I think the problem here is really “what flavor of EU are you referring to?” On this page alone are postings from 3 or 4 different EU sites, many contradicting the other. This (along with a general dearth of peer-reviewed, published papers on EU) make it difficult to provide you with an acceptable reply. This difference of “opinion” seems oddly similar to debate among physicists as to what nonbaryonic particles or interactions constitute or contribute to Dark Matter, except that thousands of papers are available on possible DM constituents. @IVAN3MAN, yes a perished polly! Gotta love the Python reference. With respect Jon Hanford, it is precisely this type of misinformation I am referring to. NO ONE has shown me ONE place within the published EU literature, which states “[EU proponents] insist EM is the *only* dominating force. This (along with a general dearth of peer-reviewed, published papers on EU) make it difficult to provide you with an acceptable reply. I am sure you know which are the ‘officially sanctioned’ EU sites. Dave Finton should be offering the reply, as he is the person who made the erroneous claim. Instead, he offered avoidance of the issue electing instead to make a sweeping generalization which is incorrect anyhow.